Many master bathrooms, both traditional and modern, focus on tried and true design elements such as glass and natural stone tile surfaces, bright hues, richly detailed vanities and many others. Some are hesitant to incorporate natural wood furnishings and decorative elements, but why? Master bathrooms with a mainly monochrome aesthetic can feel cold, and adding natural wood details can not only warm up the room, but also adds dimension and texture. With technology so prevalent in our daily lives, adding more organic, natural materials to our living spaces puts us closer to nature. No matter your unique design preferences, natural wood can be incorporated into a wide range of bathroom aesthetics and styles with stunning results. Natural wood can act as both a contrasting and unifying component in a master bathroom. It can also help highlight other areas or design elements you may want to showcase. For instance, using rich, natural wood shelving can add sophistication to a room with a bold floor tile. Let’s take a look at some master bathrooms with unique uses of natural wood in their decor. Consider natural hardwood instead of traditional tile flooring in your master bathroom. We love the way the dark wood floors contrast with this all white bathroom to stunning effect. You don’t need to spend a fortune or completely overhaul your bathroom to add a wood element. 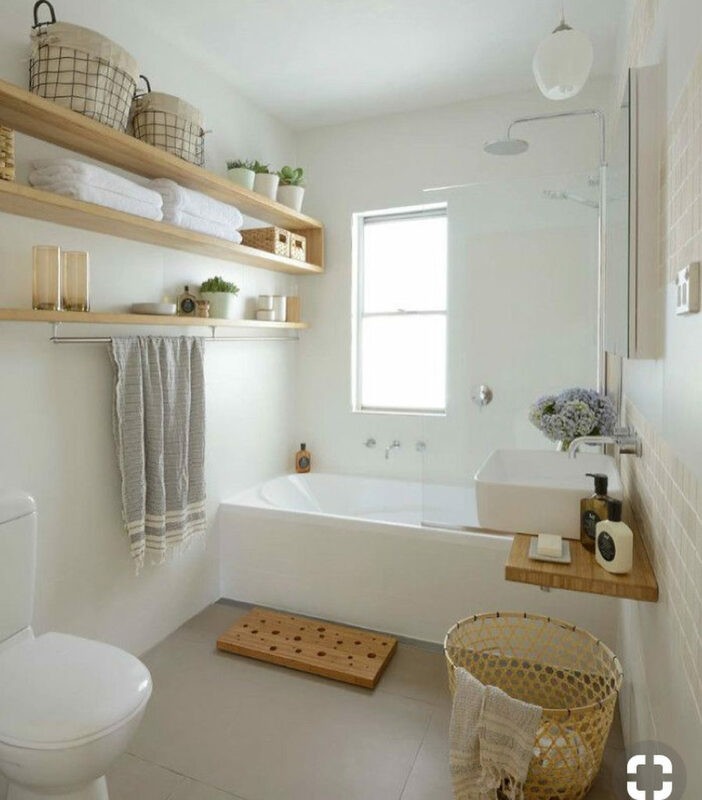 Here, natural wood shelving and a simple floating wood vanity provide a compelling contrast the monochrome décor. This simple wood accent wall provides a strong style statement and completes the look of this room. Note the freestanding black tub on wood planks. Here is an example of a tasteful wood vanity and cabinets providing the perfect contrast (and compliment) to a bold patterned tile floor.